GESU Womens Shining Envelope Clutch Purses Evening Bag Handbags For Wedding and Party. (Black) | What Should I Say? VERSATILE DESIGN---Glitter clutch purse easy to match your shoes, Princess style dress,or nail polish as well for wedding or prom,make you chic and elegant. FLAWLESS INTERIOR--- Not too small or too big, Pretty cute but spacious inside, Enough space for your essentials,such as smartphone iphone 8 Plus,lipstick, tissues,keys,small mirror makeup and credit card. FLEXIBLE CARRY---You can hold this evening bag IN YOUR HAND or you can also use it as a SHOULDER BAG or CROSS BODY BAG with the chains coming with the purse (detachable strap is 46.49 inch ). PERFECT GIFT---Great for your bridemaids,your lover or family members as gift in special day,such as Wedding,Birthday,Valentines Day,Mother's Day,Christmas Day. 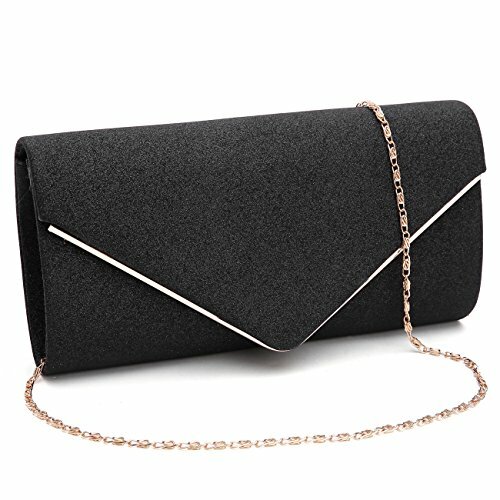 MULTI OCCASIONS---As evening clutch is perfect for parties, weddings, date nights, or family reunion, prom, banquet and cocktail party when you take part in special occasion. as a daily clutch,Stylish, leisurely when you're out of the street and have a vocation.